AJ tells Guddan that he doesn't remember her so there's no point being married anymore. 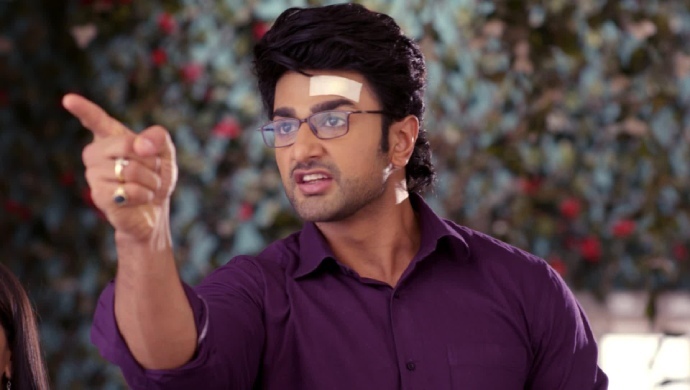 In the previous episode of Guddan Tumse Na Ho Payega, AJ leaves the hospital and comes back home. When he gets back, AJ fails to remember Guddan. The doctor checks him and tells the family that AJ has suffered partial memory loss. Guddan is shaken when she realizes that AJ has forgotten his marriage to her. Angad senses a chance and renews his chances to get married to Guddan. In tonight’s episode, Guddan goes into Angad’s bedroom. She takes two live wires and plans to give him a shock. Just as she is about to give the electric shock to Angad with the live wire, AJ pulls her hand away. He leads her out of the room and towards the temple. He asks Guddan to not do anything rash. Guddan asks AJ if he does remember her. AJ tells her that he remembers her and loves her. However, he plans to continue with the act. Guddan demands for a reason to pretend having a memory loss. AJ says that he is searching for the mastermind who is using Angad. He promises Guddan that he will marry her soon. The next morning, Guddan is given divorce papers. She confronts AJ about the divorce in front of the whole family. AJ tells her there’s no point in staying married if he doesn’t remember her. Guddan tears the divorce papers and walks away. Later AJ goes back to console Guddan. Durga catches AJ speaking closely to Guddan and becomes suspicious. Durga tells Angad that something is going on between AJ and Guddan. Angad refuses to believe her. To prove her point, Durga adds cashew nuts to the Kheer. Guddan is allergic to Kheer and AJ knows that. He tries to stop her from eating the Kheer by telling her to not sit at the table. Later Guddan, herself, refuses the Kheer when she sees cashew nuts in it. Durga’s plan doesn’t work like she hoped. Guddan is saved from having the Kheer without AJ stepping in. Just then, Rocky shows up to stay with the family. Durga is waiting to see how Guddan and AJ react to Rocky’s presence. How will AJ-Guddan deal with Rocky again? Stay tuned to find out.